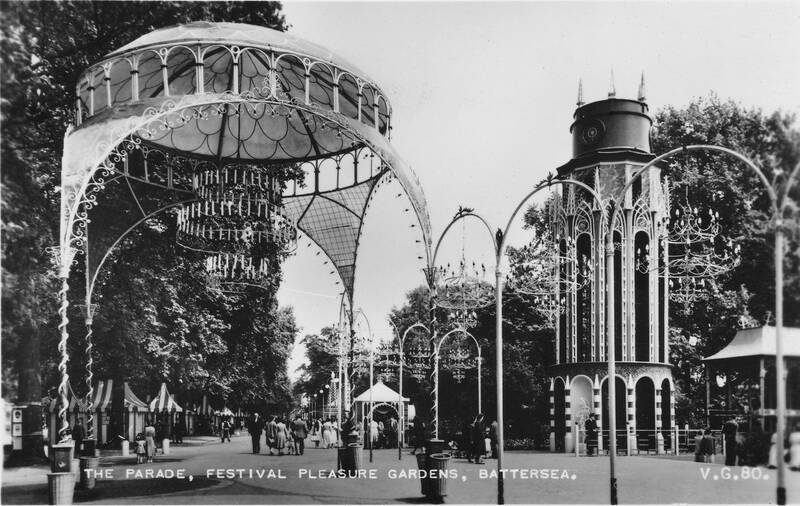 The next stop in my exploration of the Festival of Britain is the Pleasure Gardens at Battersea. Many of those who visited the South Bank festival site would have taken one of the shuttle boats from the South Bank piers to the pier at Battersea Park, however I had a day off work on the hottest day of the year, and caught the Circle Line to Sloane Square then walked across Chelsea Bridge to explore Battersea Park and see what reminders there are of the festival. 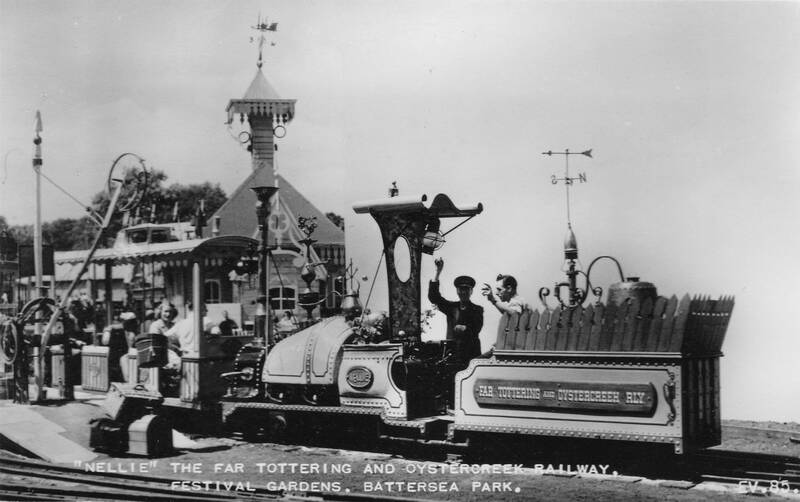 The Pleasure Gardens at Battersea Park were very different from the rest of the Festival of Britain events. All the other core events were educational and informative. 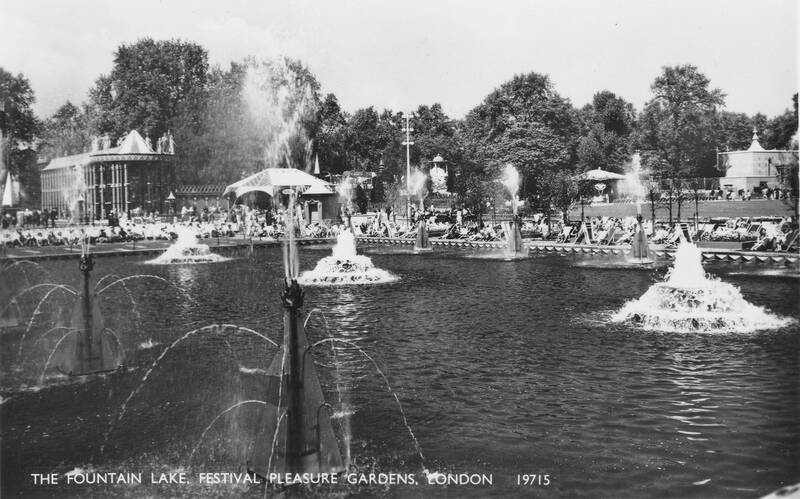 The intention of the Pleasure Gardens was to balance the other events and add an element of fun to an otherwise mainly serious festival. 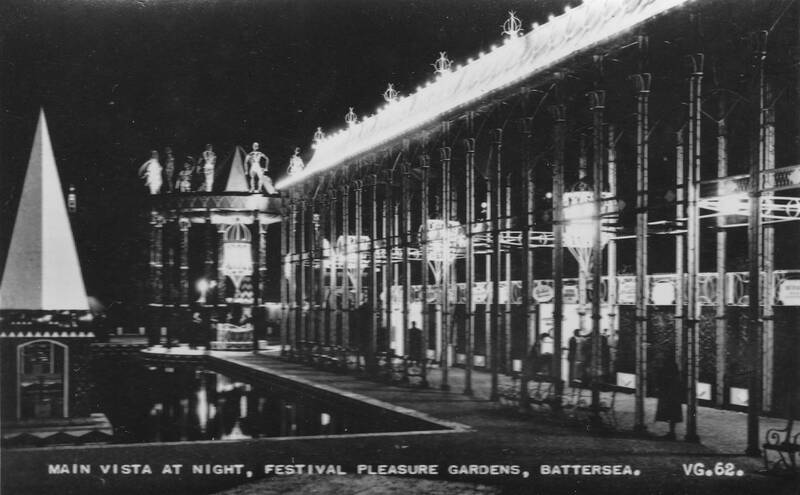 The Pleasure Gardens allowed commercial sponsorship. 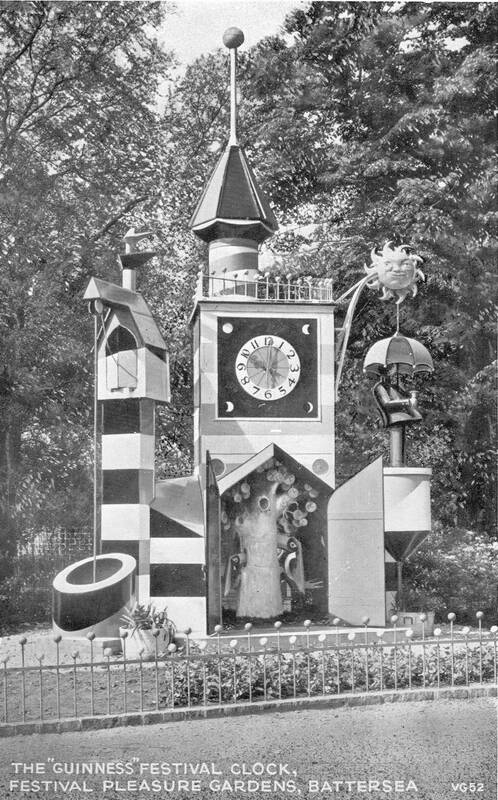 Unlike the other events where the display of a manufacturers product was based on the excellence of the design, demonstration of innovation and a British manufacturing success, the Pleasure Gardens had a number of sponsored events and displays. 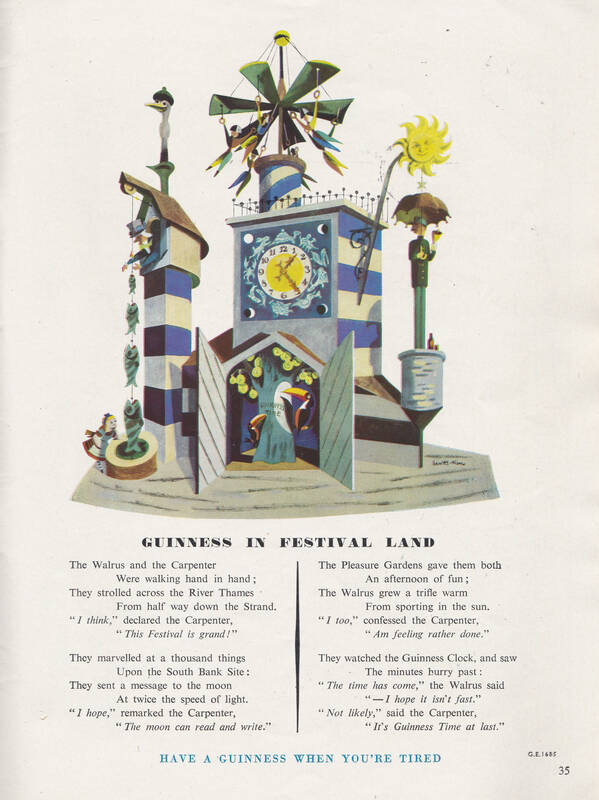 Whilst the majority of goods displayed at the rest of the festival were British, the Pleasure Gardens sourced a number of the fairground rides from the US. The latest and most exciting rides could not be obtained in Great Britain at the time. You could shop at the Pleasure Gardens. 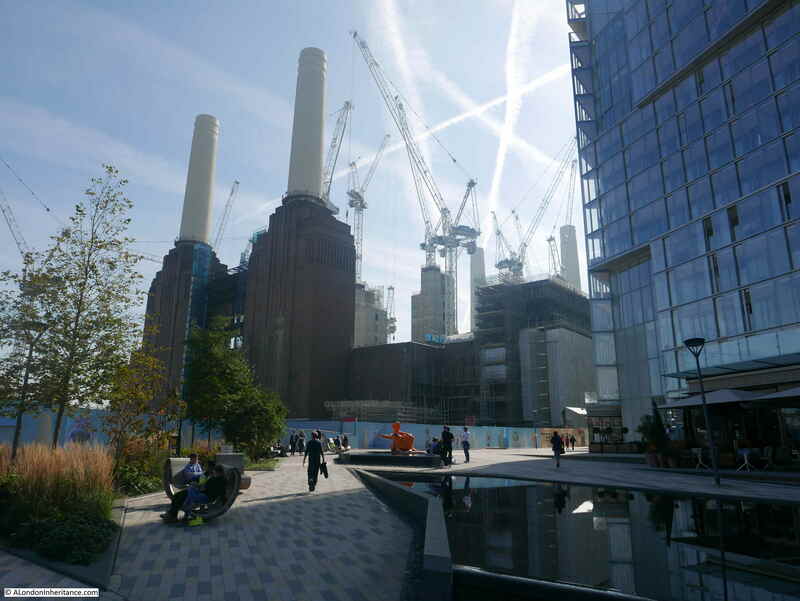 The experience of shopping for luxury goods was a core part of the Battersea event. 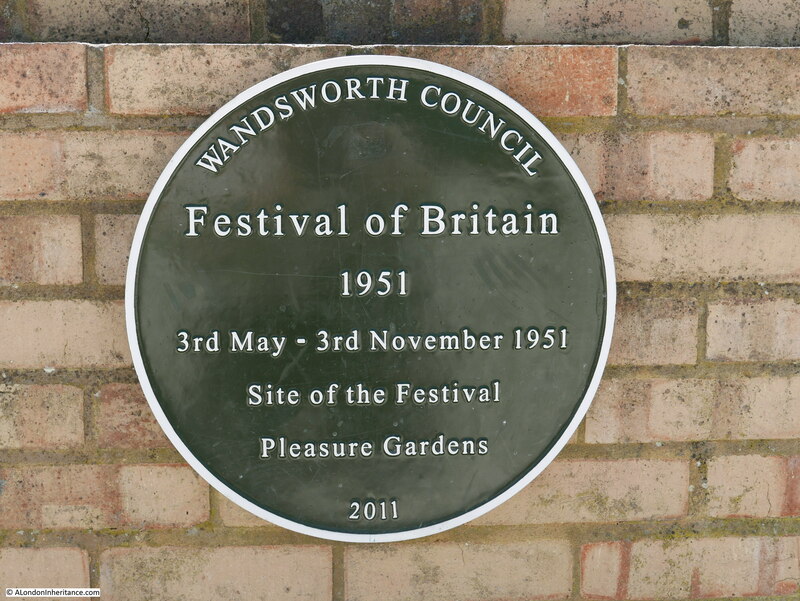 Although the other festival sites presented a history of the land and people of Great Britain, they were essentially forward-looking – how the creativity and industry of Great Britain would create a better future – the Pleasure Gardens were more nostalgic including references to earlier pleasure gardens at Vauxhall, Ranelagh and Cremorne, traditional entertainments such as Punch and Judy and Music Hall along with gardens, water features and Rowland Emett’s Oyster Creek railway. 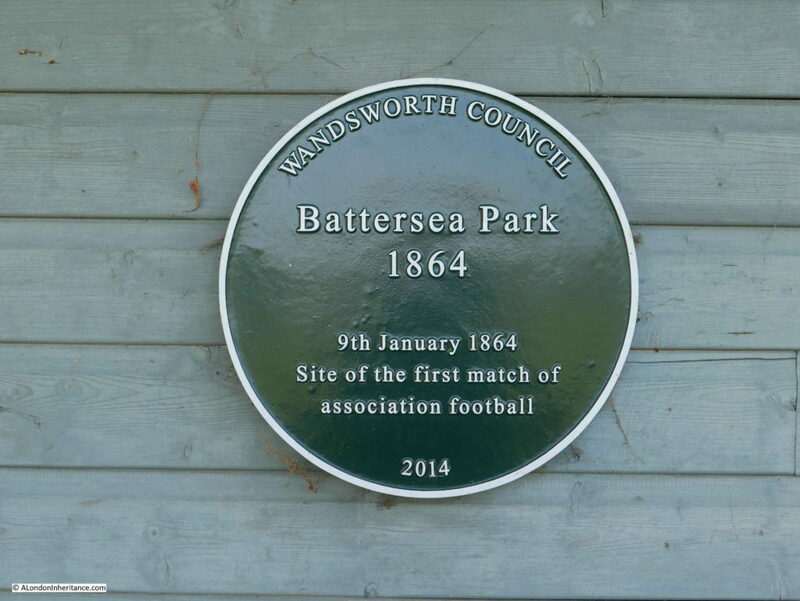 As with the South Bank festival, Battersea was a target of the Beaverbrook press along with much of the Conservative party who viewed the festival as a waste of money. 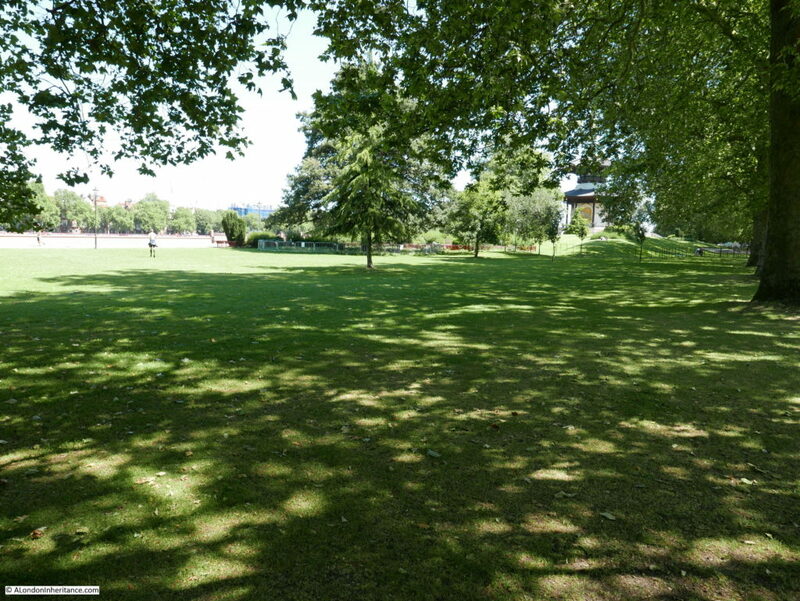 The plan for the Pleasure Gardens was put on hold for a year, and then only went ahead with half of the budget estimated by the planners (hence the real need for commercial sponsorship). 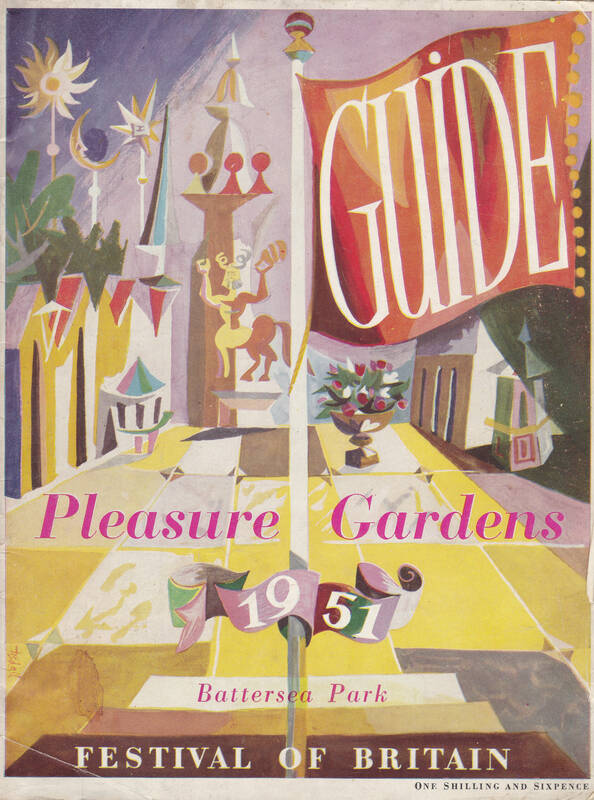 The cover page of the guide for the Pleasure Gardens is very different from all the other official guidebooks to again highlight that the visitor would have a very different experience here than at the other events such as the main festival site, the exhibition of science etc. 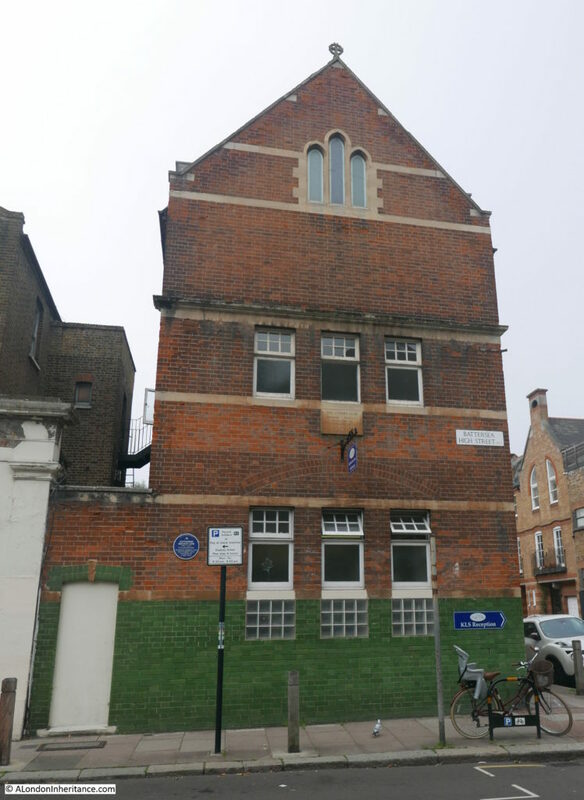 These were highly qualified people, for example Bernard Engle who was responsible for two of the beer gardens was a Fellow of the Royal Institute of British Architects and Arthur Braven, responsible for the Festival Snack Bar was an Associate of the Royal Institute of British Architects. 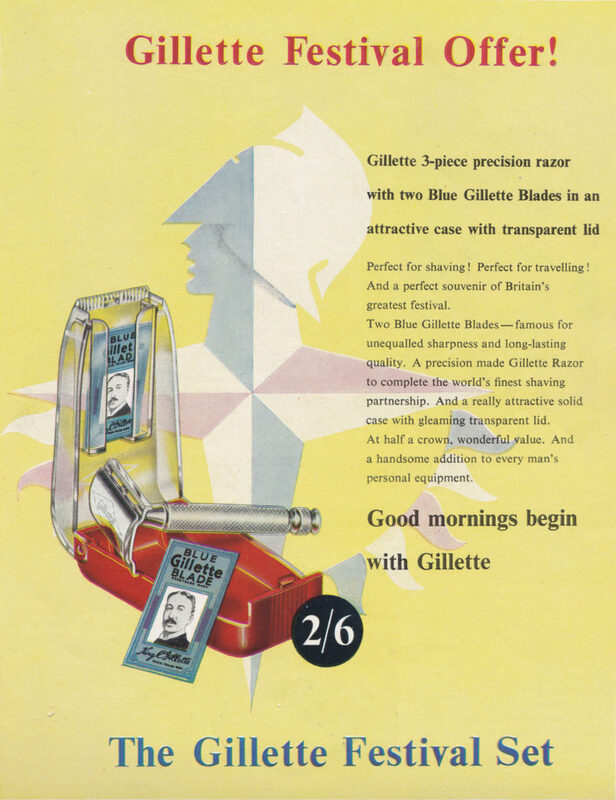 They also designed other aspects of the festival, for example Arthur Braven designed the interior of several London double-decker buses that carried out a publicity tour of Europe for the festival. The Riverside along the Thames which included the pier where boats docked bringing visitors from the South Bank piers. 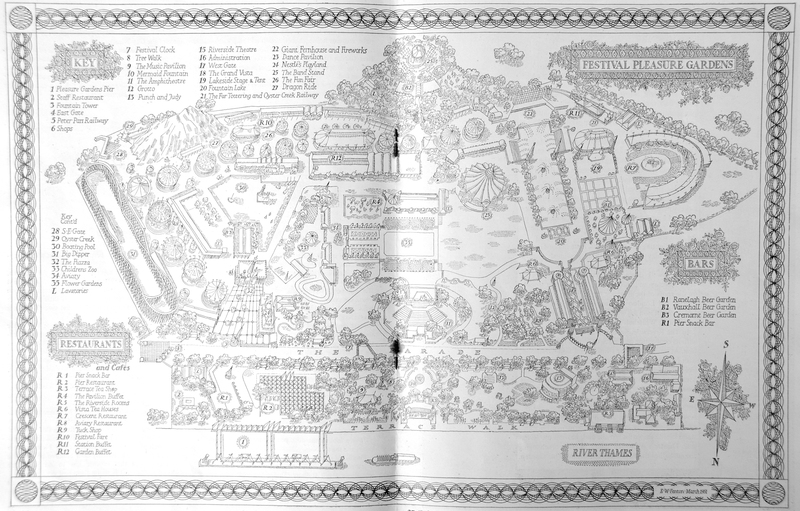 The overall view of the Festival Gardens site is shown in the following map from the Festival Guide (as usual, click on the map to open a larger version). As with the South Bank festival site, my father took very few photos of the Pleasure Gardens, just a set of photos of one of the entertainments which I will show later, so as with the South Bank site I have been collecting postcards over the years to understand what the site looked like and I will feature some of these in this post. 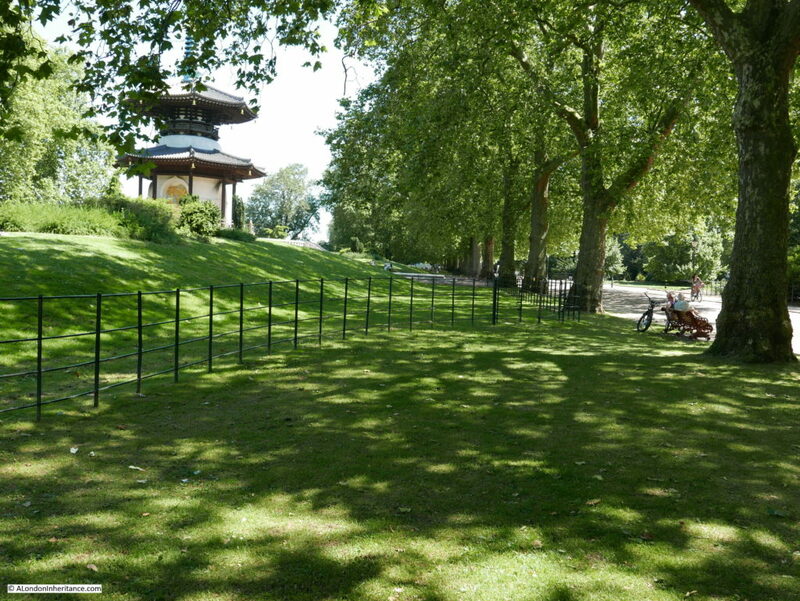 Of all the festival locations, it is Battersea Park where there is still much to be seen relating to the festival. 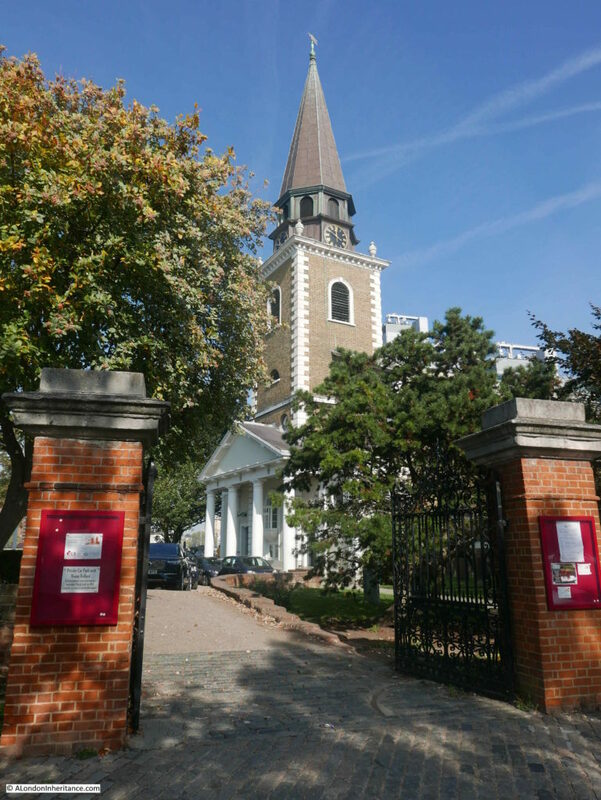 This was probably helped by the fact that many of the festival installations, such as the fun fair remained for many years after the festival closed, and Wandsworth Council have also carried out some excellent restoration work to some of the festival locations. 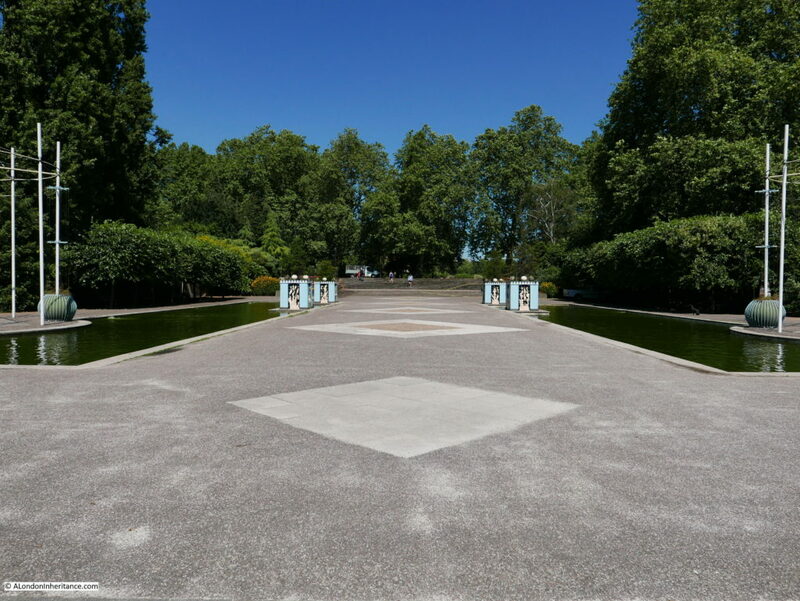 I took along a copy of the guidebook to help understand the site, probably the first time it has returned to Battersea Park since 1951. Referring back to the map of the site, I will start at the large round tent just to the lower right of the top staple. 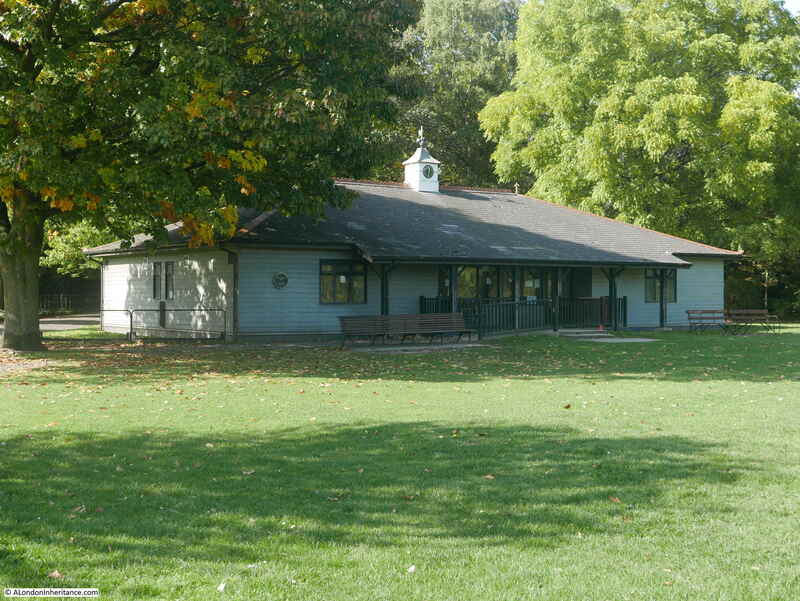 This is the Dance Pavilion. The external appearance of the Dance Pavilion was of yellow and brown canvas, but on entering the pavilion a more sophisticated sight greeted the visitor where a second layer of canvas was hung from the central pole on which was also mounted a large chandelier. The Dance Pavilion was apparently the largest tent of its type in Europe at the time. The dance floor was made out of oak strips surrounded by a red carpet. There was an orchestra stage and along the walls of the pavilion were alcoves. 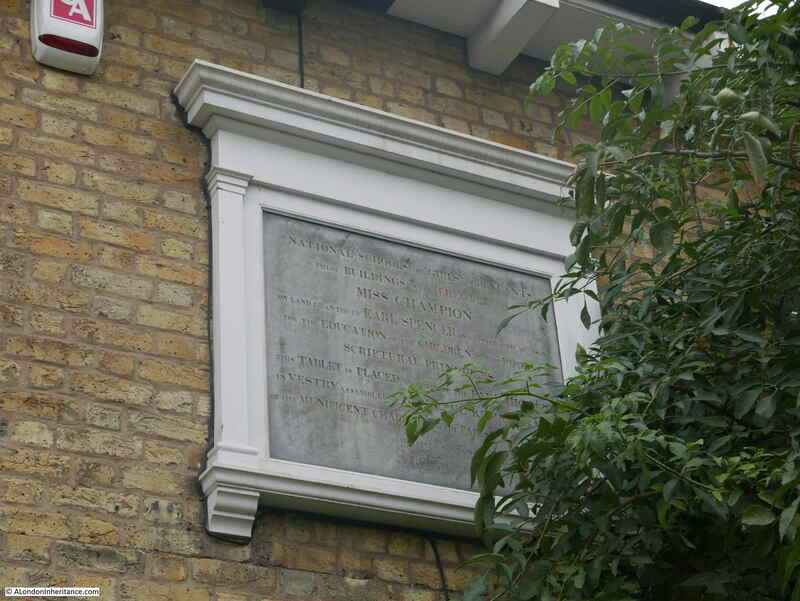 The majority of the lower surround of the pavilion was of glass. There was space for 400 couples on the dance floor and 700 spectators on the surrounding red carpet. Regular dances were held, but it was at night when the chandelier lit up the pavilion that, in the words of the guide “the pleasures of the night are afoot”. 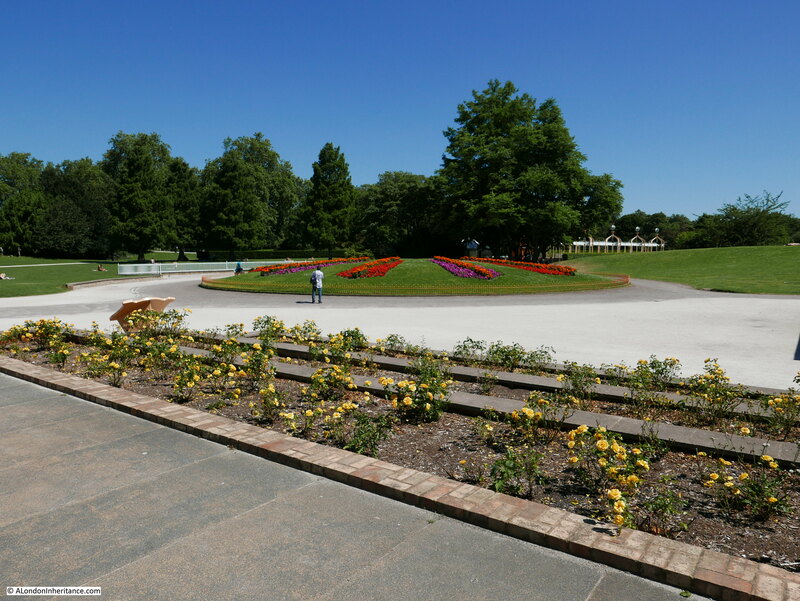 Although there is no sign at the site, by checking the map against the physical features that still remain, the location of the Dance Pavilion seems to where this circular raised flower bed is located today. 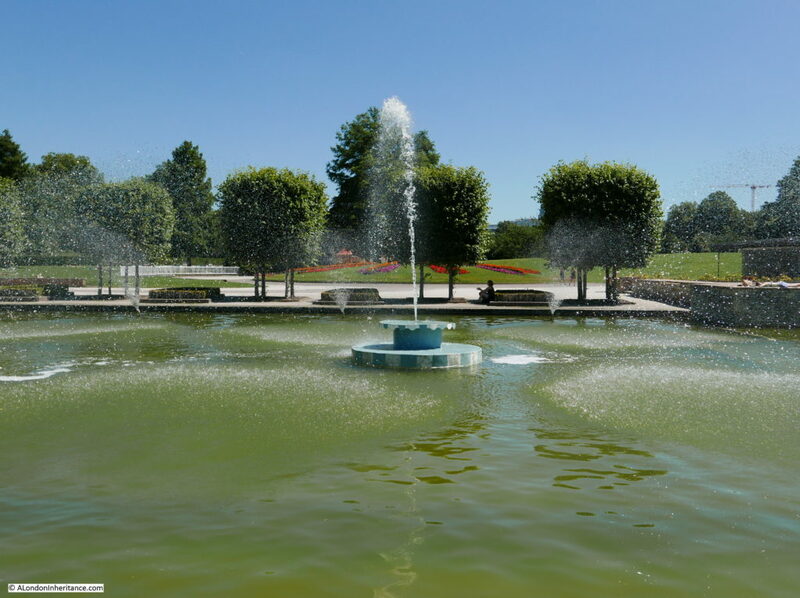 Just to the right of the Dance Pavilion, is the Fountain Lake. This was part of the Grand Vista that ran from the Parade through to the Fern House and firework platform and formed a long view with water features on either side. 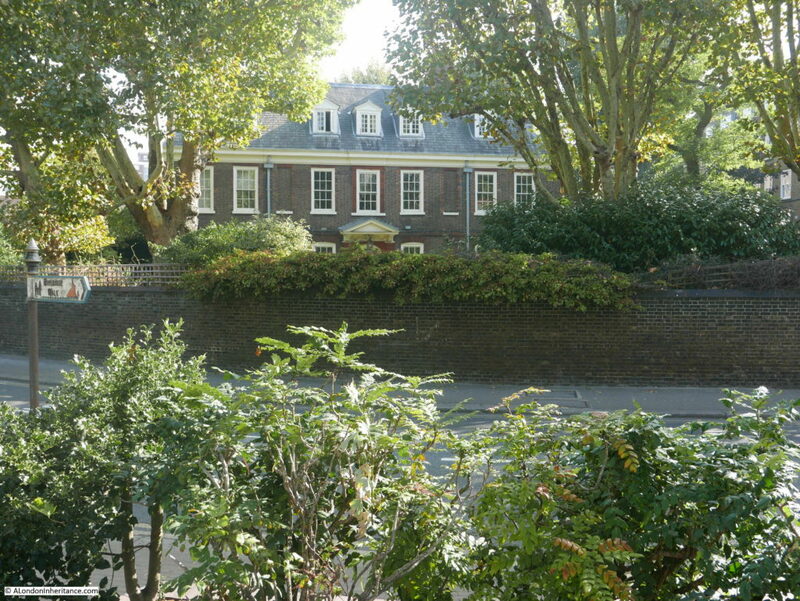 The intention with the Grand Vista was to emulate the visual effects seen in the parks surrounding English country houses, or along the processional vistas of Paris and within the grounds of Versailles. 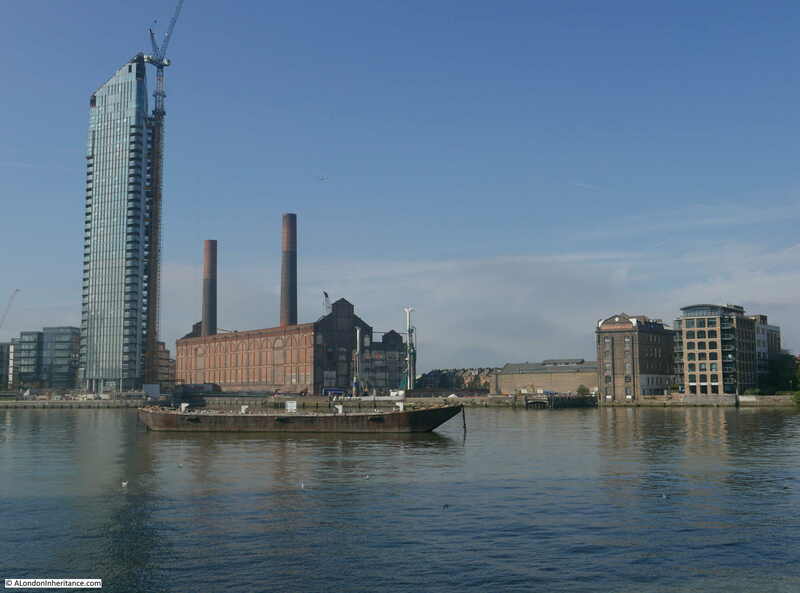 Battersea was on a much smaller scale and importantly, cost, but still produced a dramatic effect. 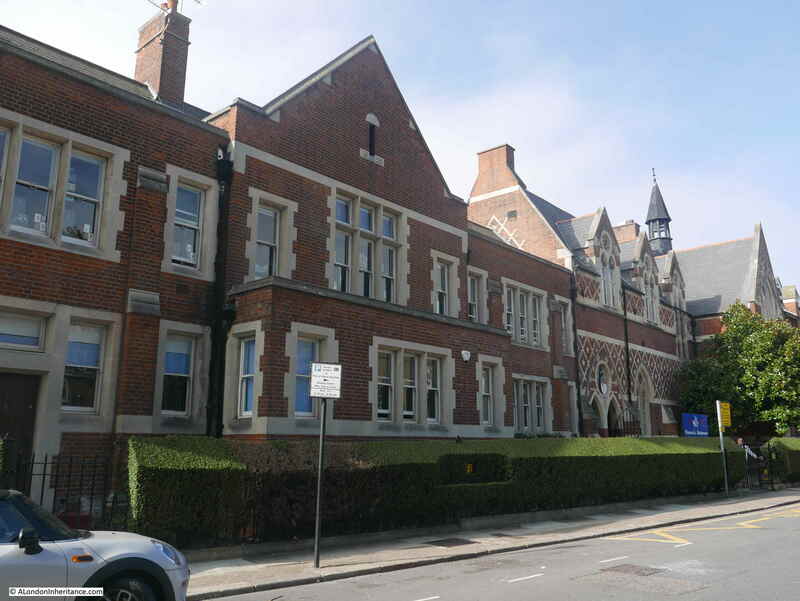 Designed by John Piper and Osbert Lancaster, the Grand Vista was approached from the Parade. Firstly, two great flights of steps led down to the area where two rectangular lakes each 100 foot long and containing fountains, with the visitor walking along the central walkway between the two lakes. On either side of the lakes were Gothic towers, arcades containing shops and cane-work statues. At the end of these two lakes was Fountain Lake. A single lake with central and side fountains that led down to the Giant Fern House and the Firework platform. Circular feature at the end of the arcades. 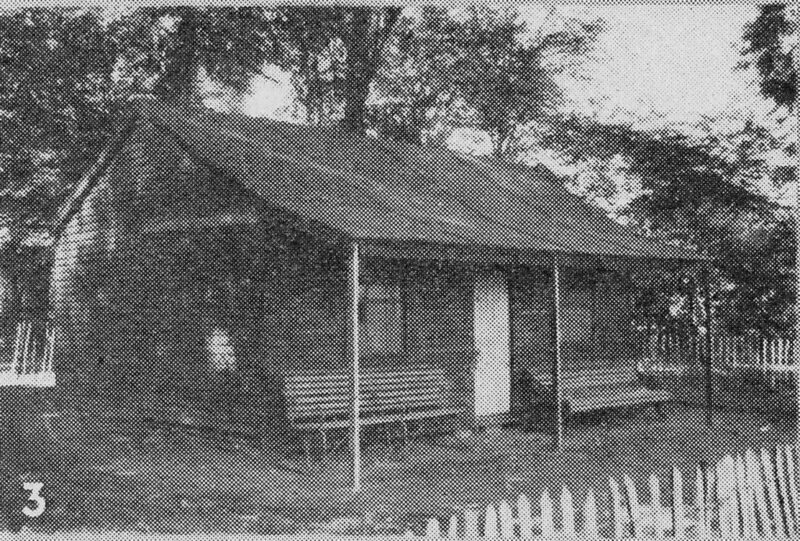 The round tent at the back of the photo is one of the Vista Tea Houses, blue and white umbrella roofed and where tea and coffee could be purchased. The main features of the Grand Vista and Fountain Lake are still to be seen today. The following photo is looking back towards the Parade from the end of the Fountain Lake. Central and side fountains still play across the lake and to the left and right are round structures of poles that mark the positions of the circular structures at the end of the arcades in the original festival (see the photos above). What I really like about the lake is the surrounding fencing at the top of the lake. 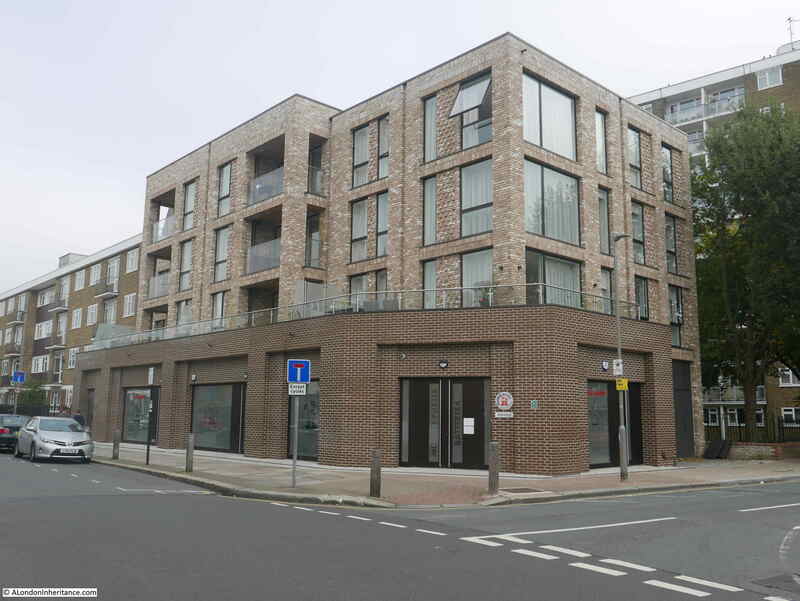 I suspect this was installed as part of Wandsworth’s refurbishment of the site rather than original, however the style is perfect for the Festival of Britain. 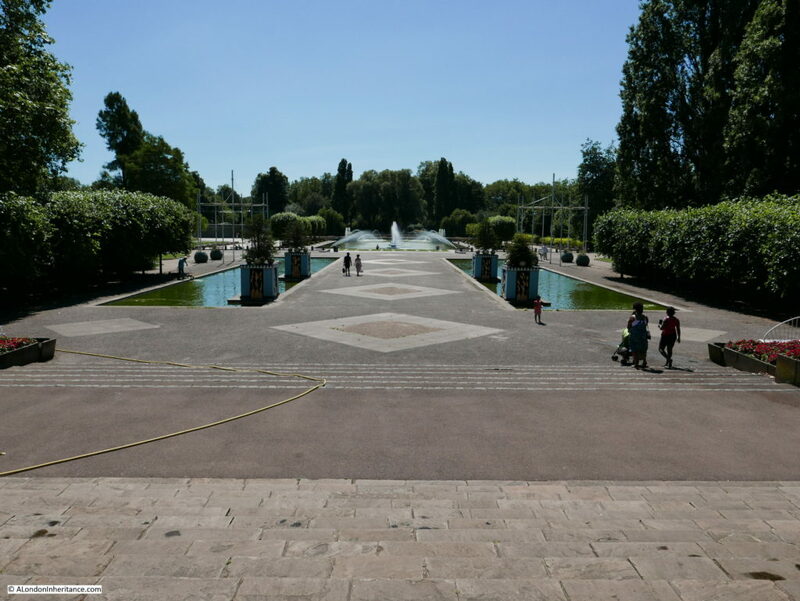 The central fountain features also look to have been restored to as they were with a concrete base to the central fountains, and the edges painted in blue and white stripes. View of the twin rectangular lakes leading up to the Parade. 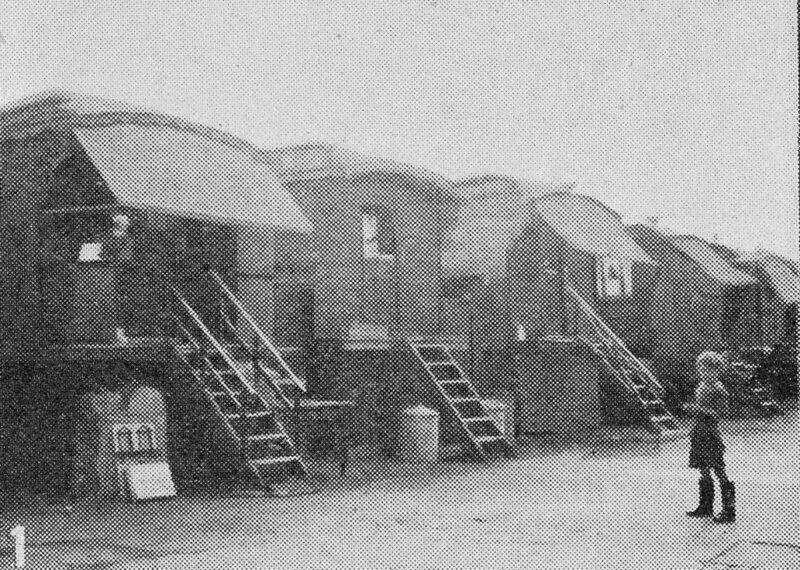 As well as the circular structures the four box structures mark the positions of similar installations during the festival – seen in the original photos above where they had cones mounted on the top of each box. Looking up towards the flights of steps leading up towards the Parade. Note the diamond patterns on the central walkway – identical patterns can be seen in the original photos. And a final view of the Grand Vista from the top of the stairs. This would have been the view that met the visitor, however at the time of the festival, there were Gothic towers, arcades, statues all lining the water features and at the far end a large fern house. It was also from the far end that the nighttime firework displays were launched. 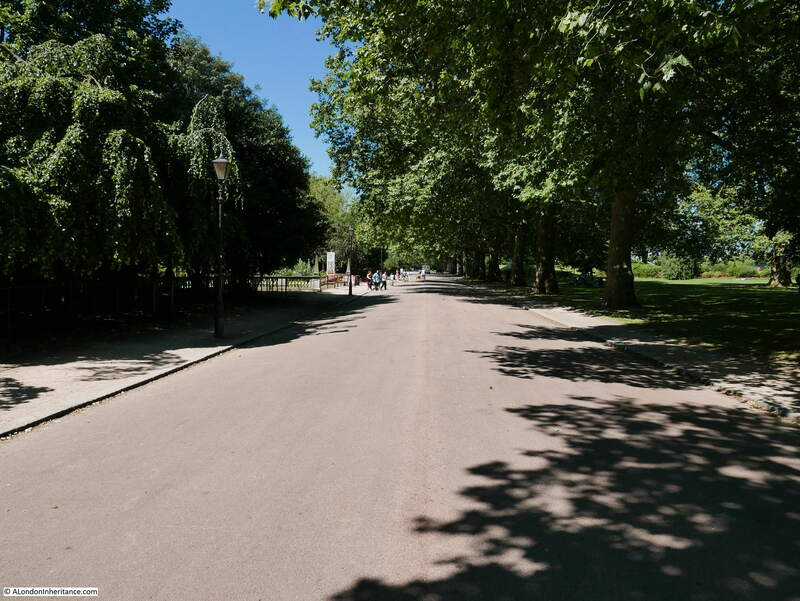 Wandsworth Council have done an excellent job in restoring this part of the Pleasure Gardens, and whilst the majority of features have long since disappeared, walking along the Grand Vista and Fountain Lake does provide a sense of what the Pleasure Gardens must have looked like in 1951. 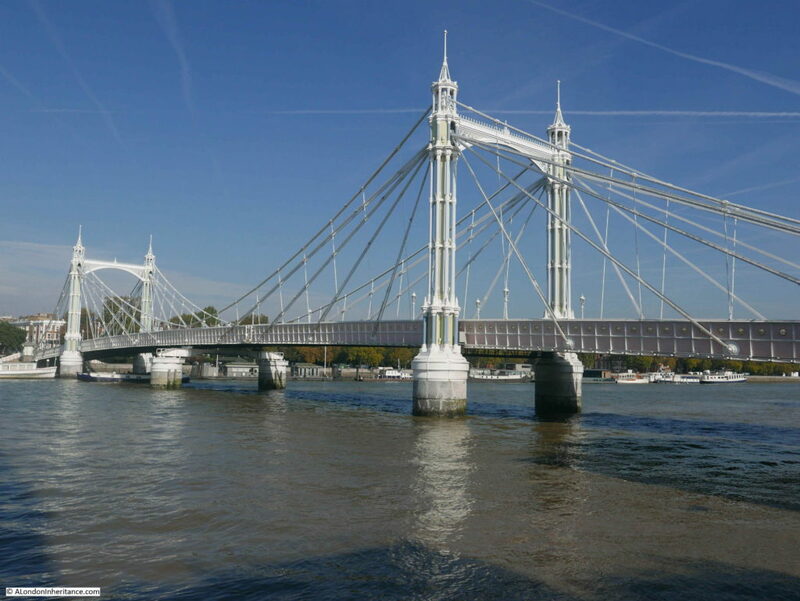 Today, the lakes provide a perfect location for Londoners to sunbathe on very hot summer days. One feature that has long since disappeared is the Far Tottering and Oyster Creek Railway. 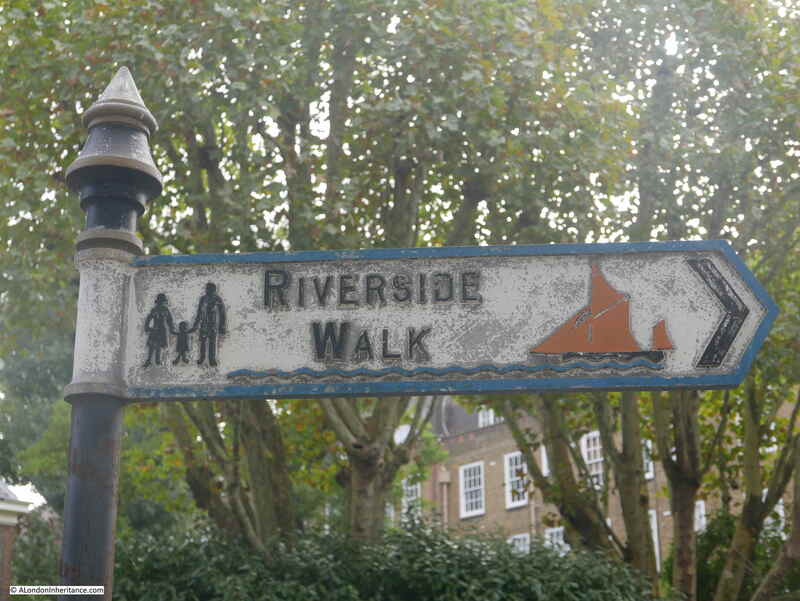 This was one of the nostalgic features of the Pleasure Gardens. 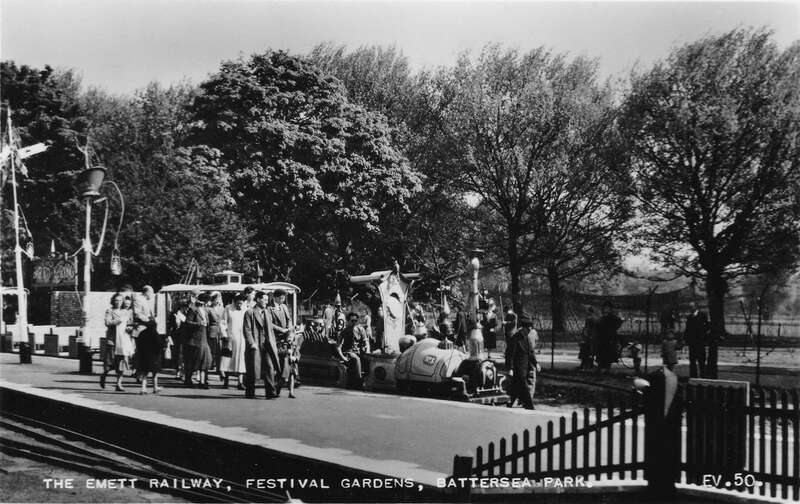 The railway had started as a cartoon series in Punch by Rowland Emett, but was created as a working, 500 yard miniature railway taking visitors from one side to the other of the Pleasure Gardens. Three trains from the cartoons called Neptune, Wild Goose and Nellie ran between the stations on a single track. “One thing this certainly won’t do justice to is the locomotive Neptune brought here specially for the nautical section of the railway. 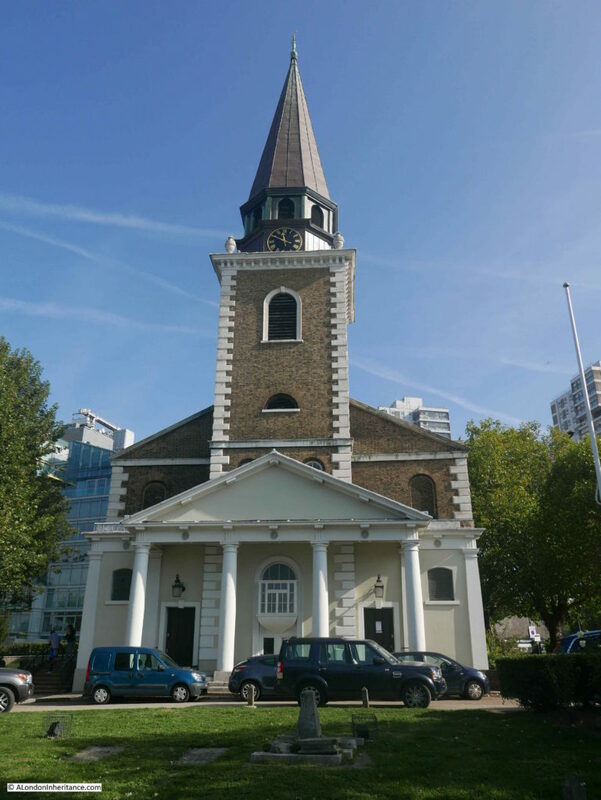 Even the directors are not quite clear about its origin but believe it was built from the wreck of the Packet Boat ‘Comet’, (she foundered – do you remember? – on a barnacle off Star Fish Point in the year eighteen hundred and what’s it). Measuring 10 feet to the funnel and 20 foot length with tender, Neptune is tough enough still to pull a train of 8 coaches with 12 passengers in each. Wild Goose is another fine bird which has been pressed into similar service. She is, I understand, the railway’s reply to British Railways air services; owing to abnormal loads being carried at Battersea, however she may have difficulty in taking off. 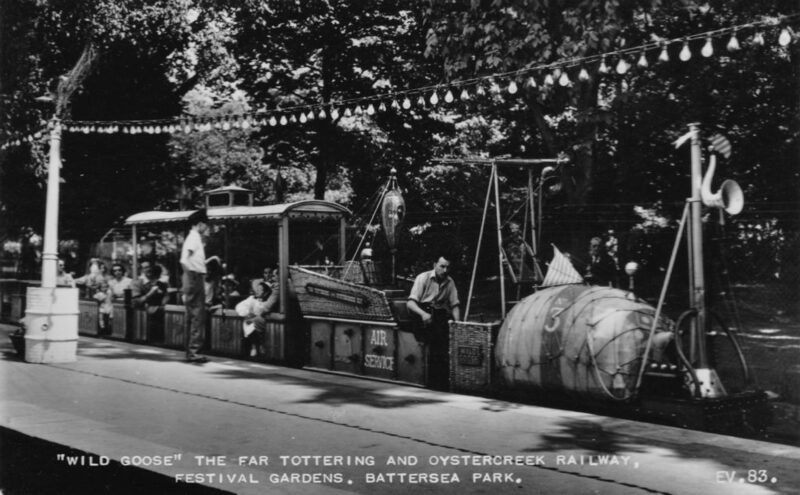 The Far Tottering and Oyster Creek Railway was one of the most popular attractions at the Pleasure Gardens. Whilst concentrating on the fantasy nature of the railway, the guide also states “For the interest of the technically minded (but don’t tell Emett) the engines are diesel electrics and the track 15 inch gauge”. 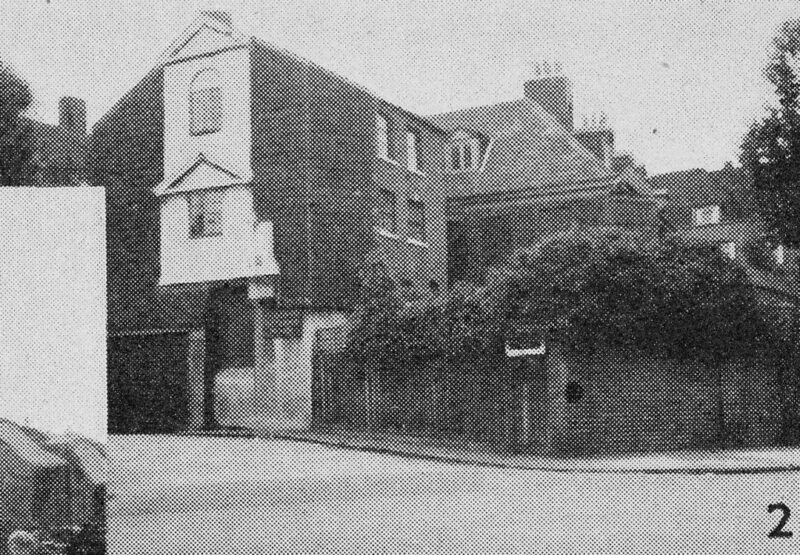 The Parade at the Pleasure Gardens ran the length of what is now Carriage Drive North. 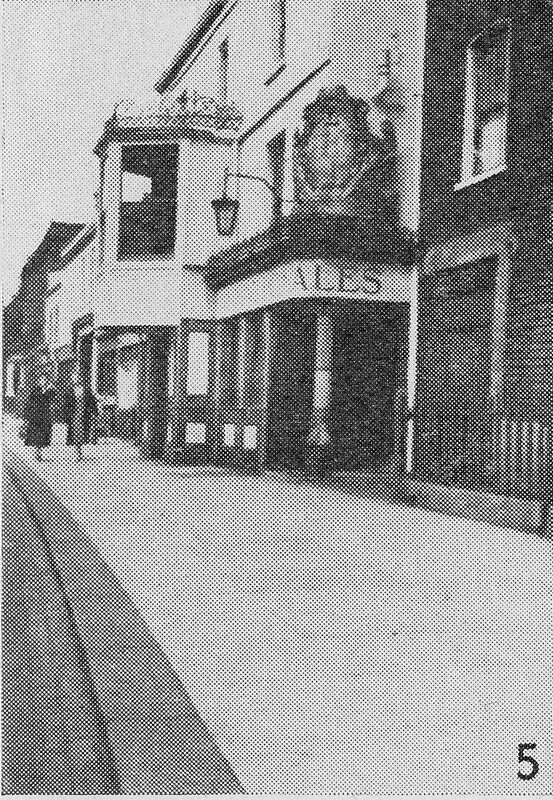 Along the parade, there were many decorative structures and features along with a range of shops. 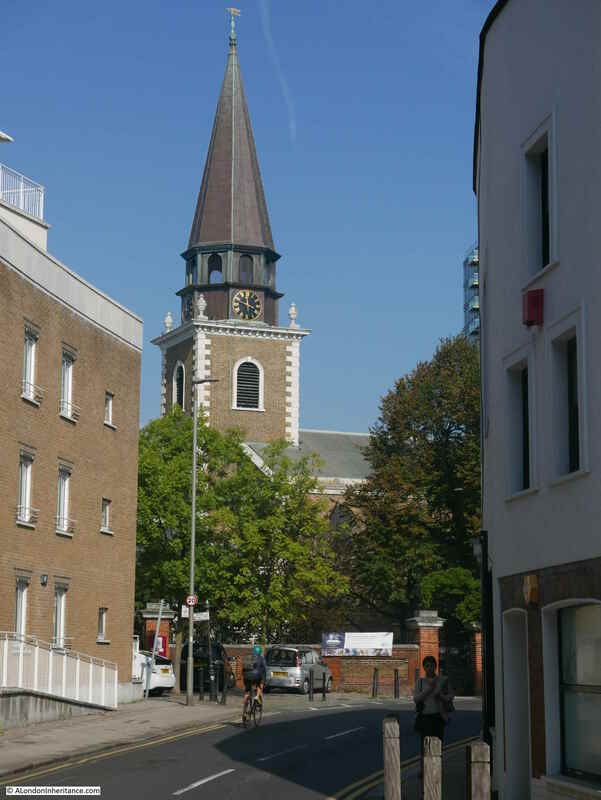 The guide stated that along the Parade “is to be found the Bond Street of the Gardens – shops whose very names spell quality and luxury. 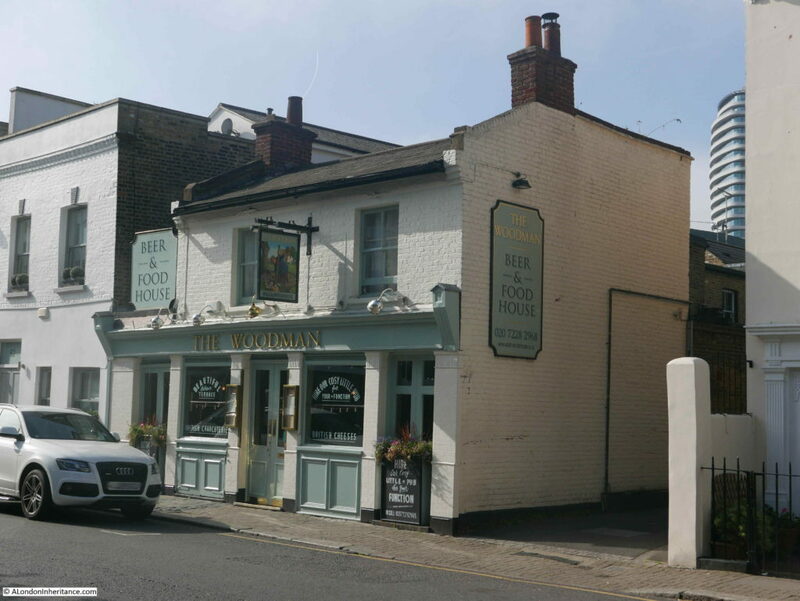 Here you will find exquisite antiques, figures in porcelain and ivory, miniatures and elegant fairings of a past age as well as modern pottery and china of all kinds. Here, too, are bright adornments for my lady – earings and necklaces of pearl and brilliants, costume jewelry of every description. 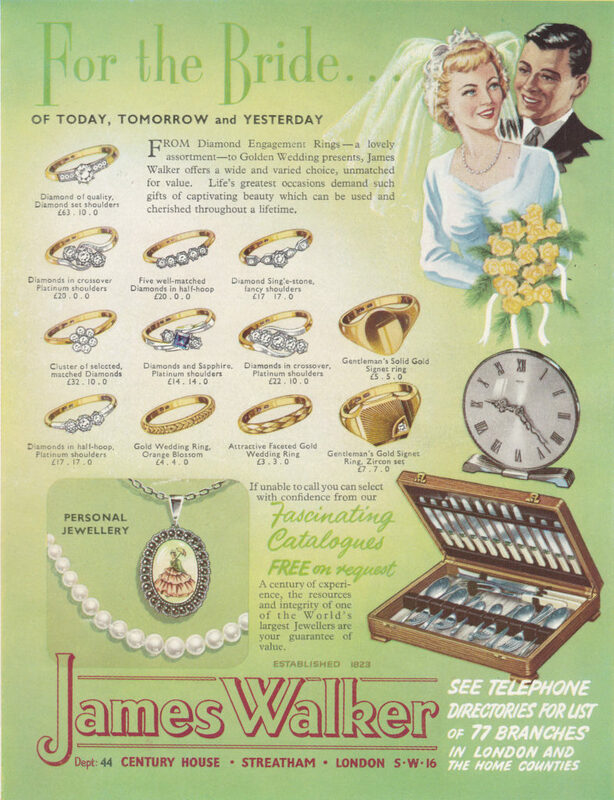 And while madam yearns over gems and fine perfumes, elegant slippers and diaphanous underwear, the mere male can can comfort himself with the contemplation (and purchase) of pipes, snuff, fountain pens, cameras, watches or razors, while younger members of the family gape at miraculous toys, stamps (including the special Festival issue), and other wonders”. The Tree Walk, a raised walkway among the tops of the trees ran across the Parade. Commercialism and sponsorship was one of the main differences between the Pleasure Gardens and all the other festival sites and events. 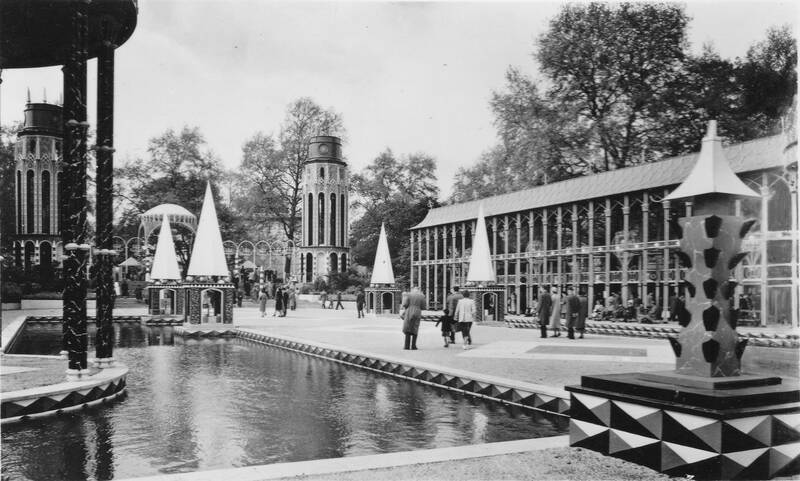 This was essential to the Pleasure Gardens due to the very limited budget allocated for the site and could be justified as the aims of the Pleasure Gardens were very different from the rest of the Festival of Britain. 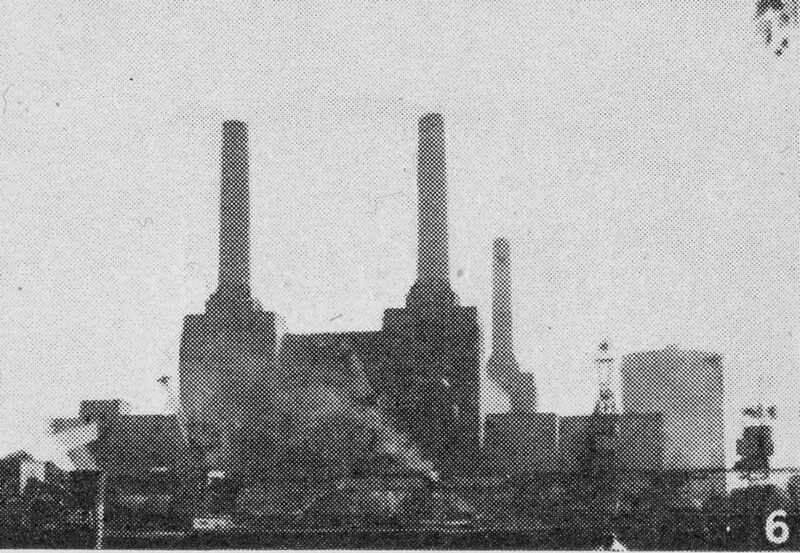 After the war, and post war period of rationing and austerity, the availability of products such as those on sale at Battersea must have seemed remarkable and if you can ignore the gender assumptions in the text from the guide, the use of words such as yearns, gapes, miraculous and wonders, as well as the reference to Bond Street are indicative of the wide spread retail commercialism of the decades to follow the 1951 festival. 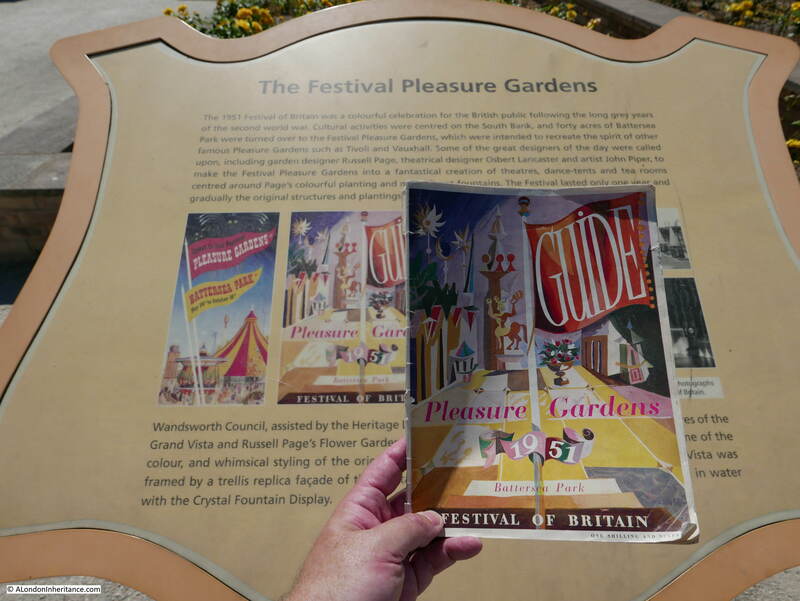 The adverts within the guide to the Pleasure Gardens are also different to the other guides. Sponsors included Guinness and their advert in the guide included a picture of the Festival Clock – their sponsored exhibit at the Pleasure Gardens. 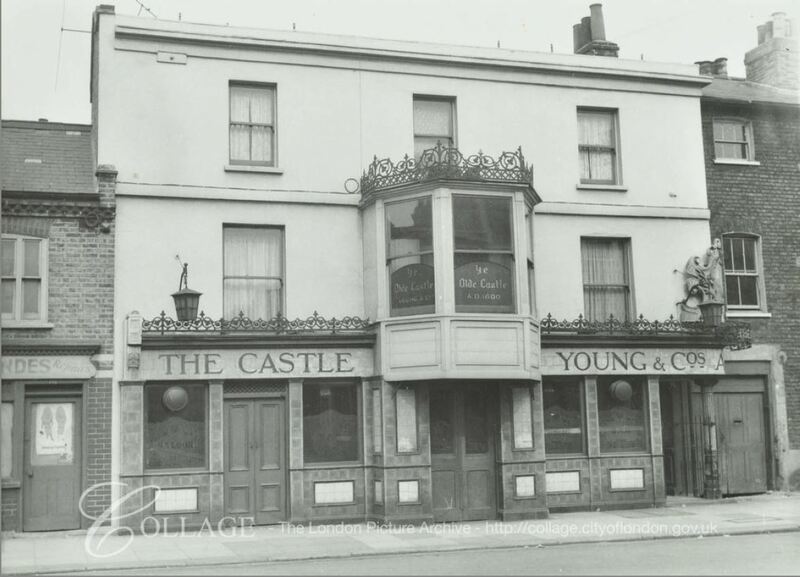 There were also three beer gardens, named after original London pleasure gardens, Vauxhall, Ranelagh and Cremorne, that were sponsored by the Worshipful Company of Brewers. The sponsors took full advantage of advertising and selling their products during the festival. At the Ladies Powder Room, “Leichner, having added lustre to the beauty of nearly four generations of stage stars, here offer facial magic to ordinary mortals. In the dove-grey salon with its twelve mirrored dressing tables, the ladies, in their pause for beauty, will find a full range of powders, lipsticks, eye-shadows in all the colours of the spectrum and cleansing creams and lotions”. In the Powder Room, advice was free, but “if you wish to be expertly made-up by one of Leichner’s Young Ladies, there is a small charge”. 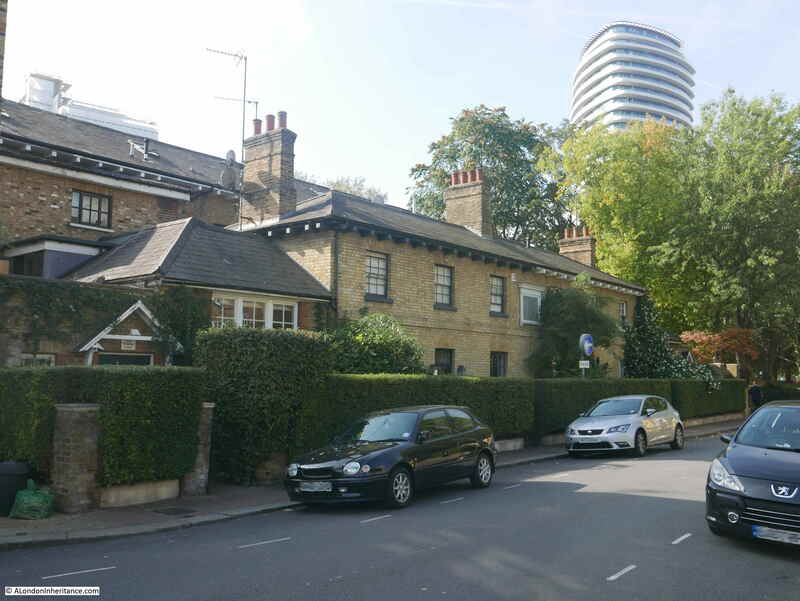 The restoration work by Wandsworth Council includes these structures which run parallel to the Flower Gardens. 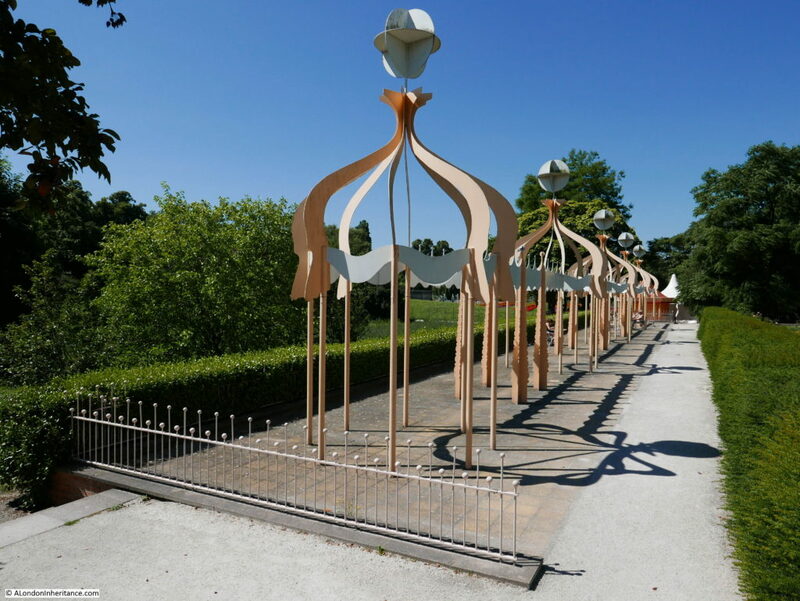 Again I doubt these are original, however the styling is perfect for the Festival Gardens, including the small fence. 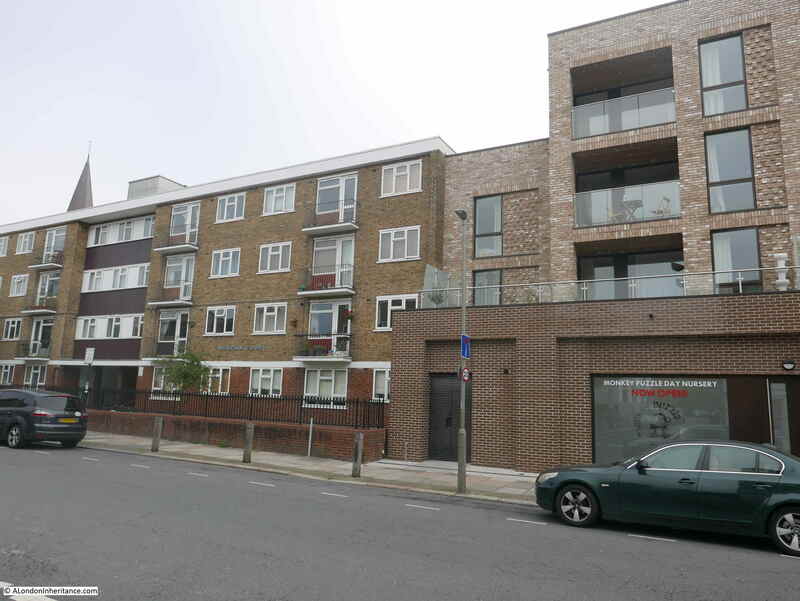 A couple of other photos of the Pleasure Gardens. Many of the structures were temporary, constructed with canvas, but all highly coloured. I have not found any colour postcards of the Pleasure Gardens however some of the films I provided links for in an earlier post include colour film of the Pleasure Gardens and show a brightly coloured site, decorated throughout with bold colours. Walking from the Grand Vista, back along the Parade, the site shown in the photo below, to the west of the Pagoda, was the site of the Riverside Theatre where shows were given by Britain’s leading puppet-makers, including names such as The Hogarth Puppets, Walter Wilkinson’s Hand Puppets along with Eric Bramwell and the Stavordales. There was also plenty of entertainment for children, including the Zoo, a Peter Pan’s Railway, the Nestle’s Playland and Punch and Judy. 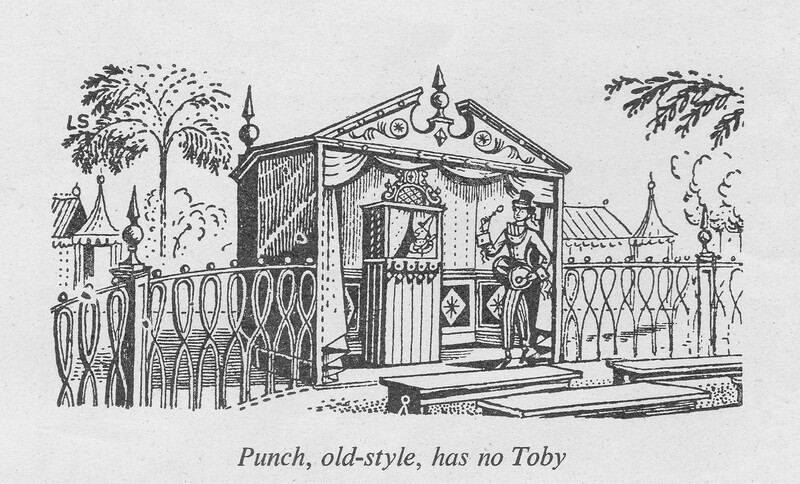 It was at the Punch and Judy that I found the only photos that my father appears to have taken at the Pleasure Gardens. 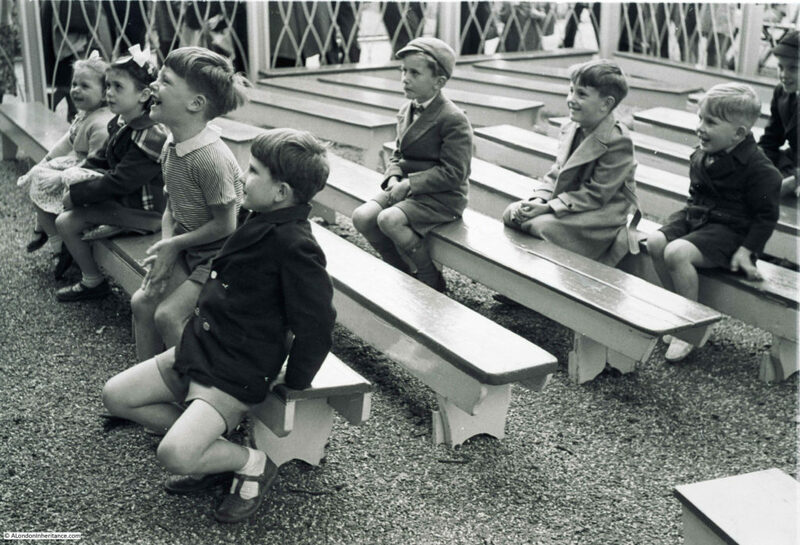 He took a series showing the expressions of children watching one of the shows. After originally scanning these negatives, I was not sure of the location, however in one of the shoe boxes containing photos he had printed, I found one of these photos with the location written on the back. 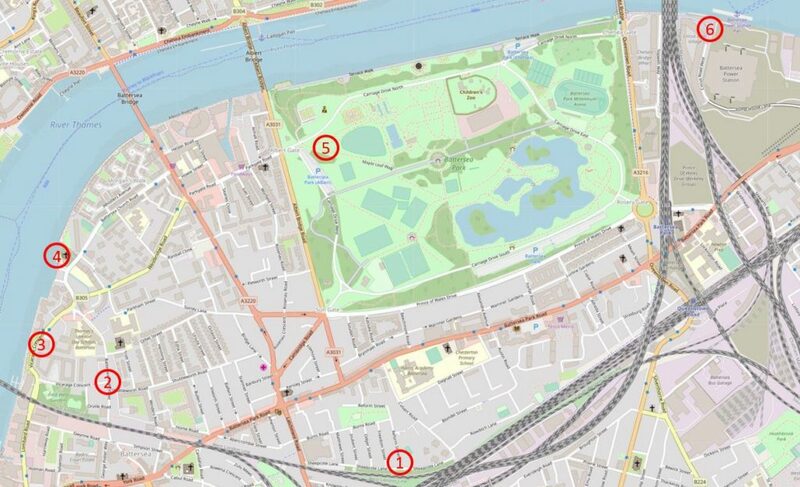 The Punch and Judy was at location 13 on the Pleasure Gardens map. 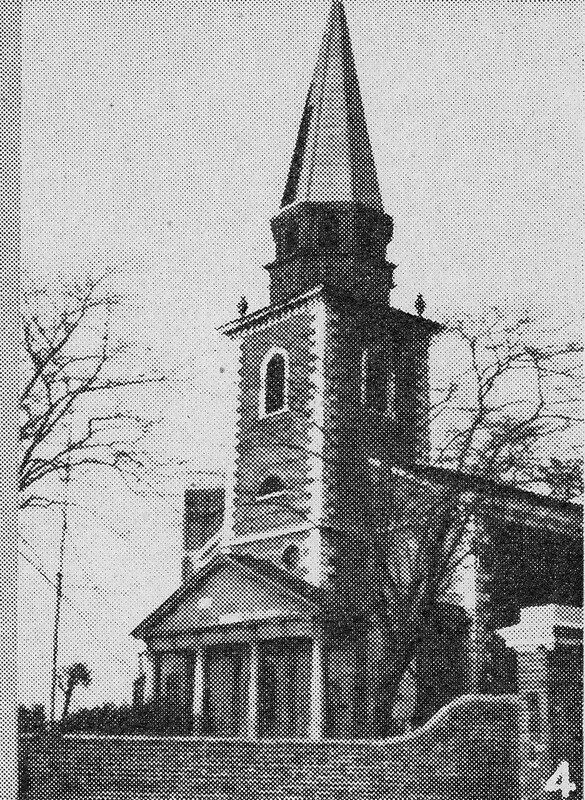 It was located along the Parade which is also lined with large trees. I have no idea how long these particular species of trees take to grow, but they look large / old and on the assumption that these are the same trees as at the festival, or later trees planted in the same places, I counted the number of trees from the entrance to the Grand Vista in the map and along the Parade today which took me to the following spot, which if correct, the Punch and Judy was in the space to the left of the bench. 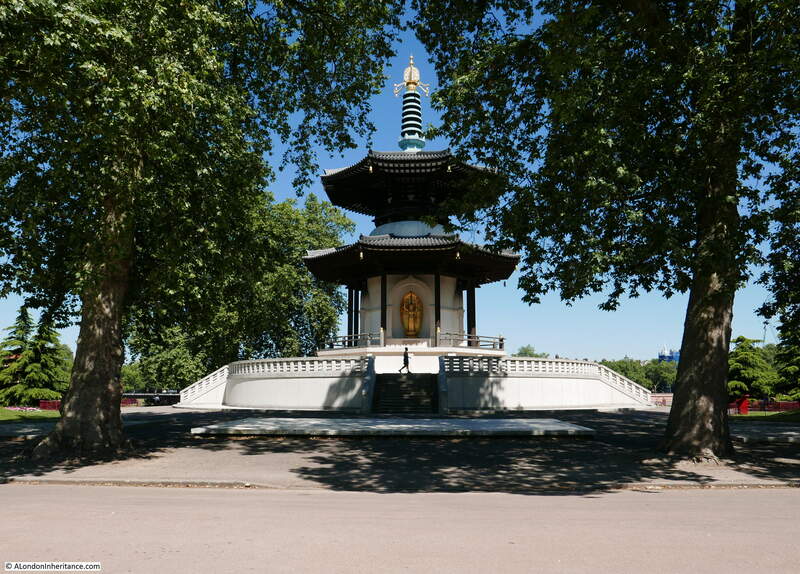 The Mermaid Fountain (sponsored by Lockheed Hydraulic Brakes) was on the space currently occupied by the Pagoda. 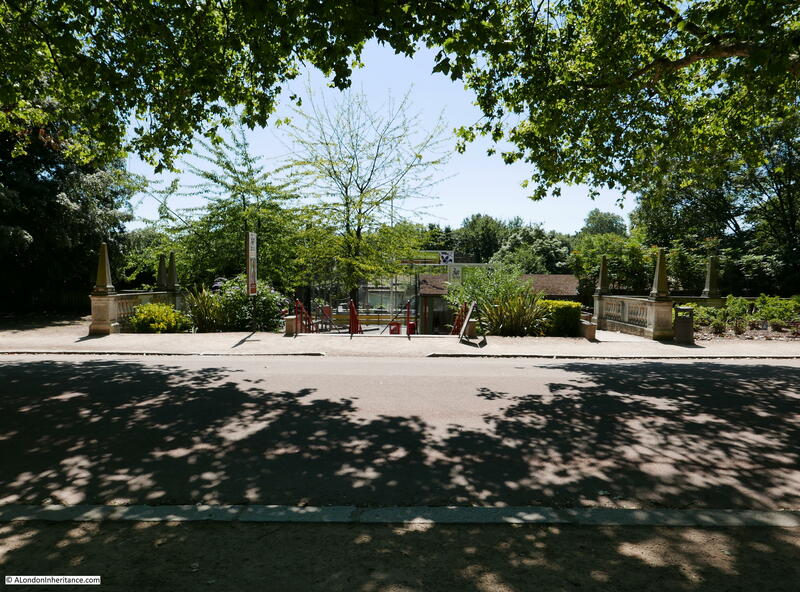 Further along is the entrance to the Children’s Zoo. 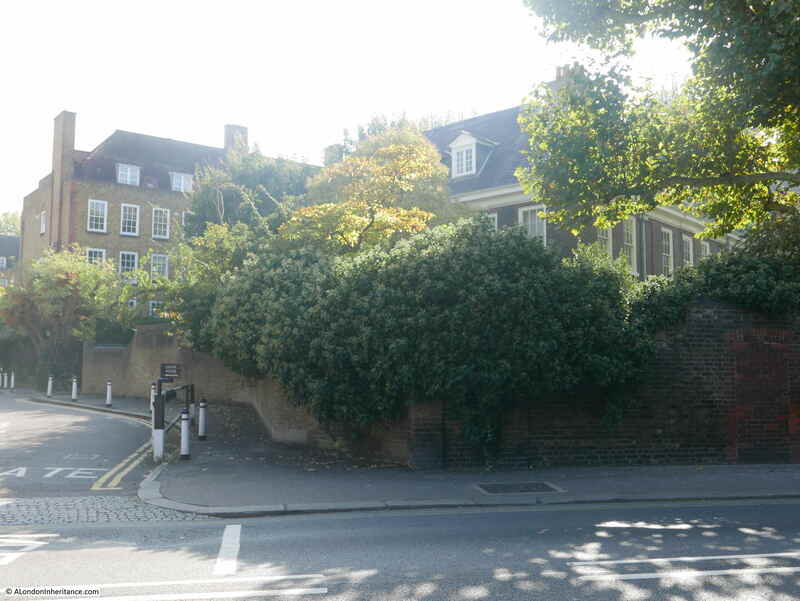 Originally, this was further back, to the east of the Flower Gardens, but has since expanded to take up the space occupied by The Piazza. The Zoo at the time of the Pleasure Gardens had two bear cubs called Ruff and Scruff along with baby lions, foxes, wallabies and a crab eating racoon with the unusual name (for a racoon) of Sally. There was a cage with monkeys, a “Mousetown building where hundreds of mice perform their antics all day long”, a llama, goats, sheep, rabbits, guinea pigs, hamsters and tropical fish and a reindeer called Rudolph. 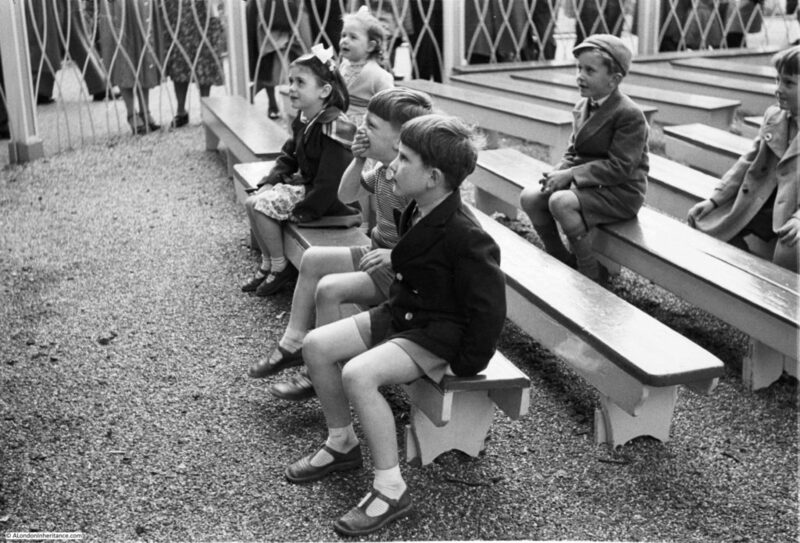 The commercial aspects of the Pleasure Gardens extended to children. The Nestle’s Playground was advertised with the text that “Nestle’s have immense experience at looking after children and making them happy.” When the parent collected their children at the end of a two hour session at the Playground, each child was given a present, which I am sure was Nestle’s branded. 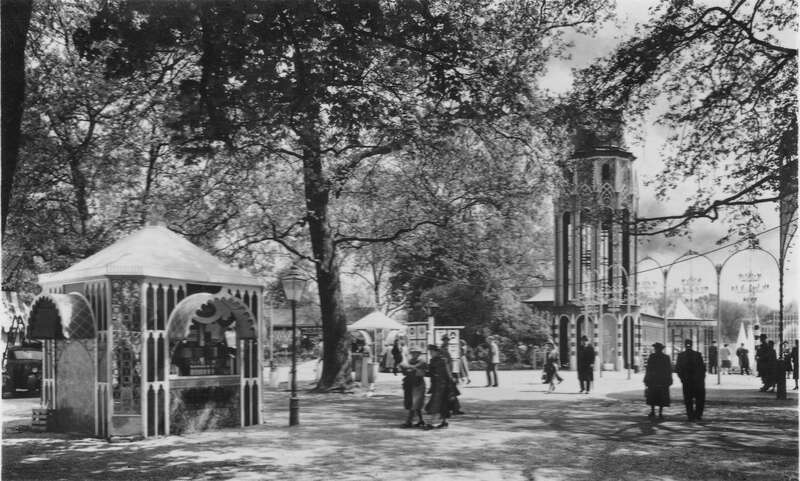 The other main attraction area of the Pleasure Gardens was the Fun Fair. The Fun Fair was probably the most controversial of the Pleasure Gardens entertainments. For the previous 12 years, the development of fun fair rides has been the last thing in the mind of British industry. 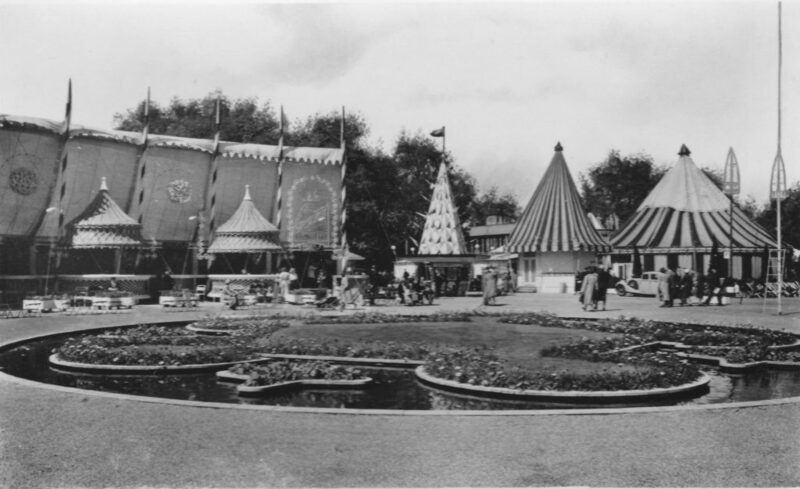 The American fun fair business had continued almost without interruption and new rides had been developed with height and speed increasing their excitement and attraction to visitors. There was nothing available in Great Britain that could hope to bring visitors the level of excitement expected from such a one off event as the Festival of Britain. The organisors of the festival therefore decided to go to America and purchase rides for use at the Pleasure Gardens. 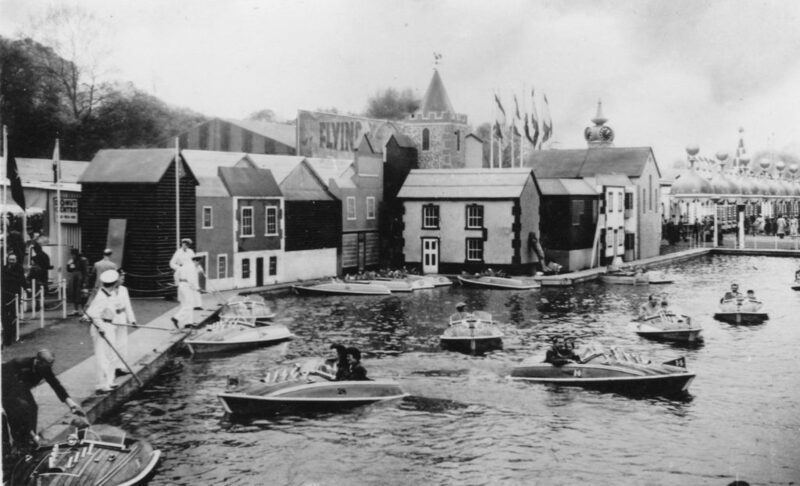 The Treasury agreed a sum of £30,000 (a significant sum at the time – even more so considering national prioirties) to spend on rides from America and a team traveled out to select and purchase suitable rides (the team included representatives from other British fun fairs as the intention was to help justify the purchase, the rides would be sold to other British fun fairs after the festival had closed). The Beaverbrook press found out about the visit and the budget with the resulting Daily Mail headlines criticising this waste of national funds. As a result of the visit, the Festival Gardens ended up with some of the latest American fun fair rides, which including the small number sourced from Great Britain provided the fun fair with Three Abreast Gallopers, Lighthouse Slip, Leaping Lena, Octopus, The Whip, Dodgems, Caterpillar, Waltzer, Moon Rocket, Big Dipper, Scenic Grotto, Peter Pan Railway, Ghost Train, Bubble Bounce, Hurricane, Fly-o-Plane, Rotor, Boomerang, Flying Cars and the Sky Wheel which would carry riders 90 feet into the air. I am not sure of the type of ride of all these, but it does sound as if the visitor would have had a good time. 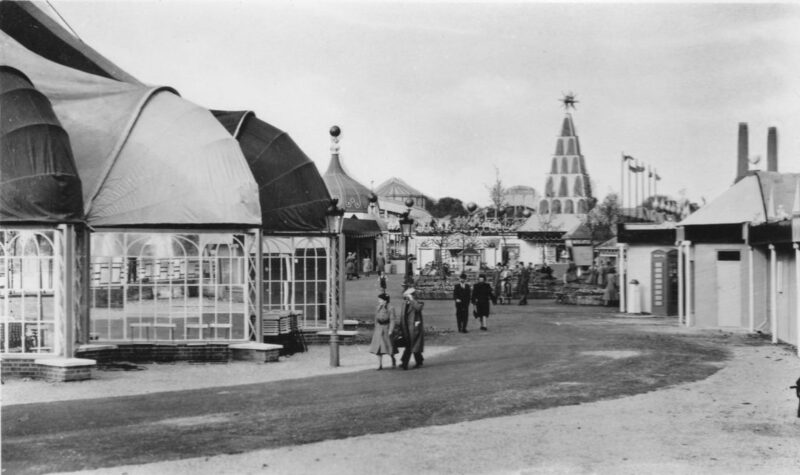 Parts of the fun fair continued long after the Festival Pleasure Gardens closed – a story for another time. The Pleasure Gardens after dark were one of the main attractions for visitors. Whether the chandelier lit dances in the Dance Pavilions, the brightly lit shops, the Fireworks, the lighting on all the main features and the lakes and fountains, it was a very different experience for those who had lived through the long years of war and post war austerity. Rockets and fireworks could be seen launched from the end of the Grand Vista or from on the lake. The trees along the Parade were lit by sodium and mercury lighting concealed on the roofs of the shops that lined the Parade. Fairy lights and multi-coloured diamond lights lit the pier on the river. 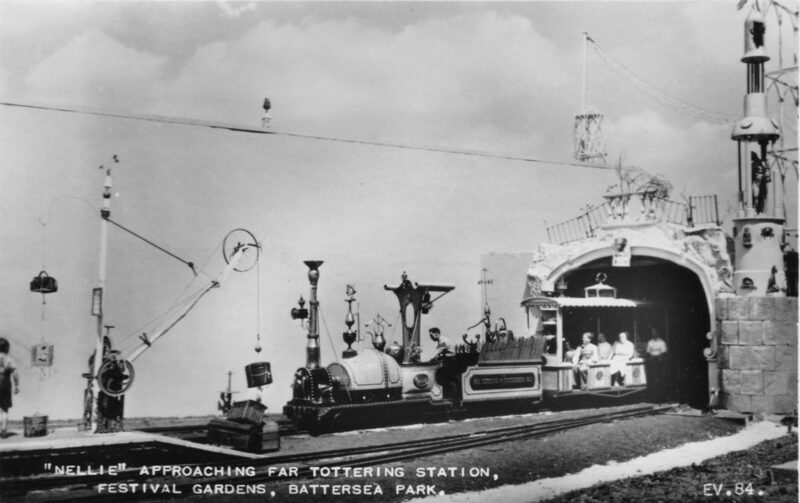 Far Tottering station was lit by bright platform lights and above the Children’s Zoo a huge lighted bird was placed above the aviary whilst fairy lamps light the pony rides below. All the individual shops, restaurants, cafes and bars had their own individual lighting scheme. 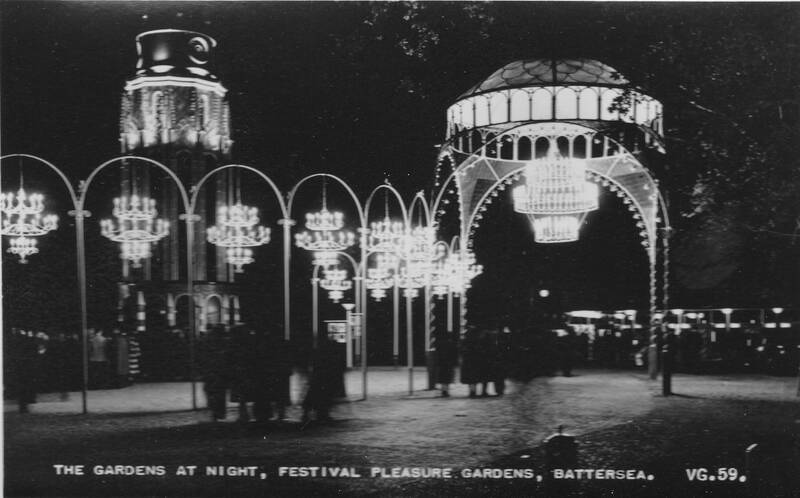 It must have been quite an experience to walk the Festival Gardens at Battersea after dark. 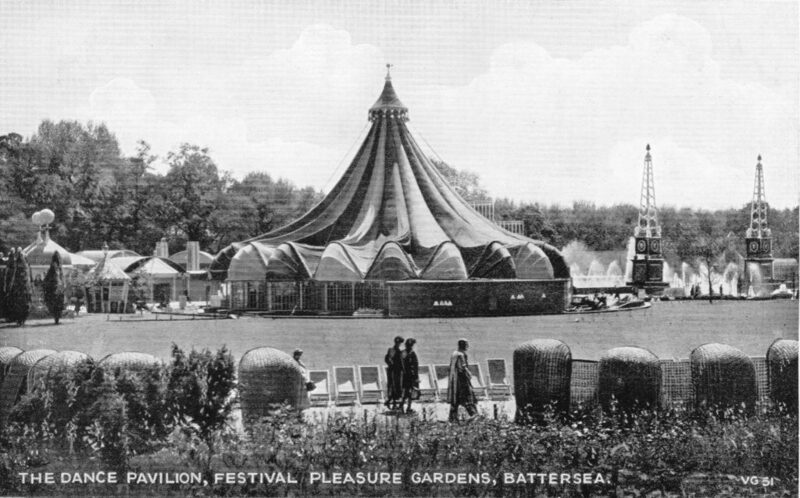 The Pleasure Gardens were very different to the rest of the Festival of Britain exhibitions, although they did share the same aim of bringing – in Gerald Barry’s words – “elegant entertainment” to the masses and creating a classless environment where different and new forms of entertainment were open to all. 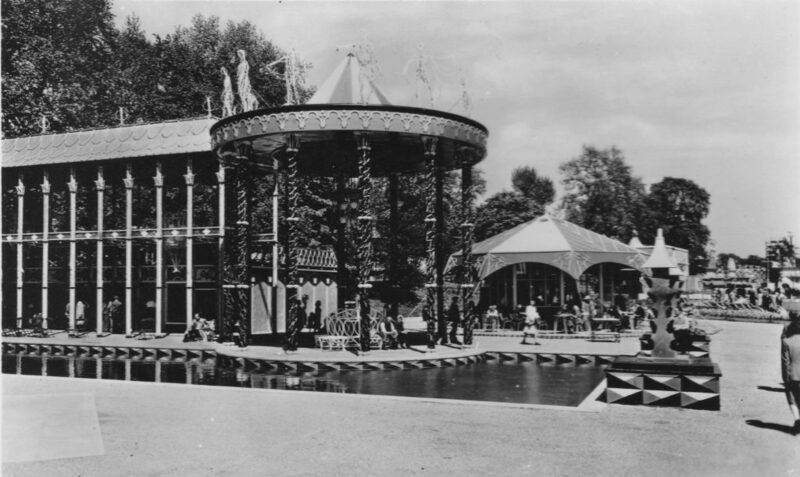 The Pleasure Gardens aligned with the Labour Government aim of trying to broaden the types of entertainment enjoyed by the majority of the British population, which an earlier Labour report had identified as being too dependent on pubs and the cinema. 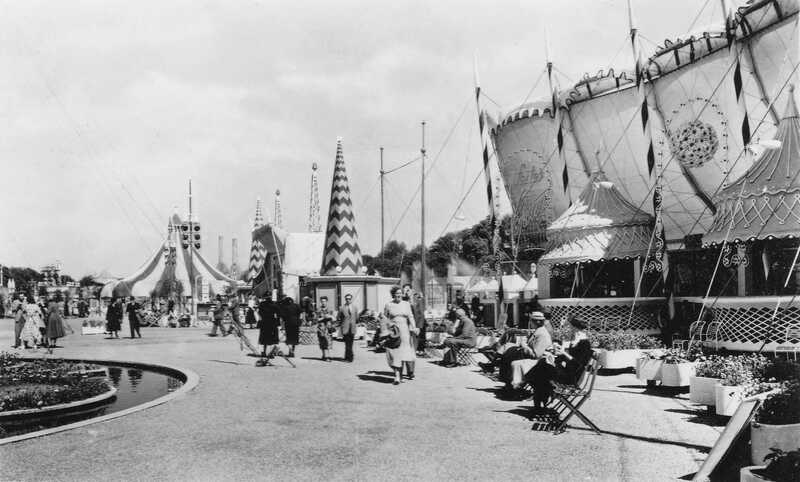 There was also concern with the population being too dependent on passive forms of entertainment, and the creeping Americanisation of entertainment (despite the purchase of fun fair rides from America). “That excellent place of amusement…is particularly adapted to the taste of the English nation, there being a mixture of curious show, gay exhibition, music, vocal and instrumental, not too refined for the general ear…and though last, not least good eating and drinking for those who choose to purchase that regale”. The Pleasure Gardens at Battersea were a great success during the Festival of Britain, however as with much else portrayed across the Festival of Britain, the ambition of bringing “elegant entertainment” to the majority of the British population would take a very different path in the decades that would follow. 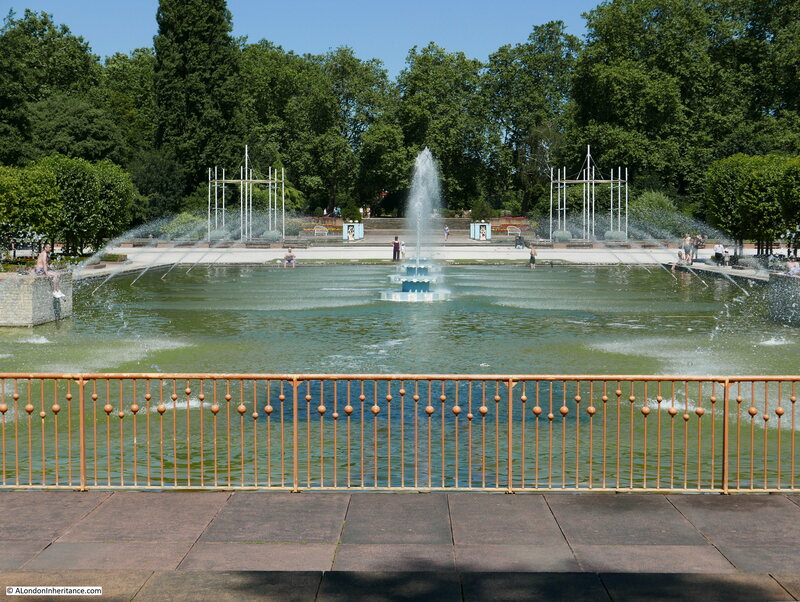 Battersea Park is well worth a visit (although perhaps not on the hottest day of the year) and Wandsworth Council have done a good job with the restoration of the area around the Grand Vista, Fountain Lake and Flower Gardens and features such as the railings really do evoke the designs from 1951. Next week is my final post on the Festival of Britain with a visit to the Exhibition of Architecture at Poplar. 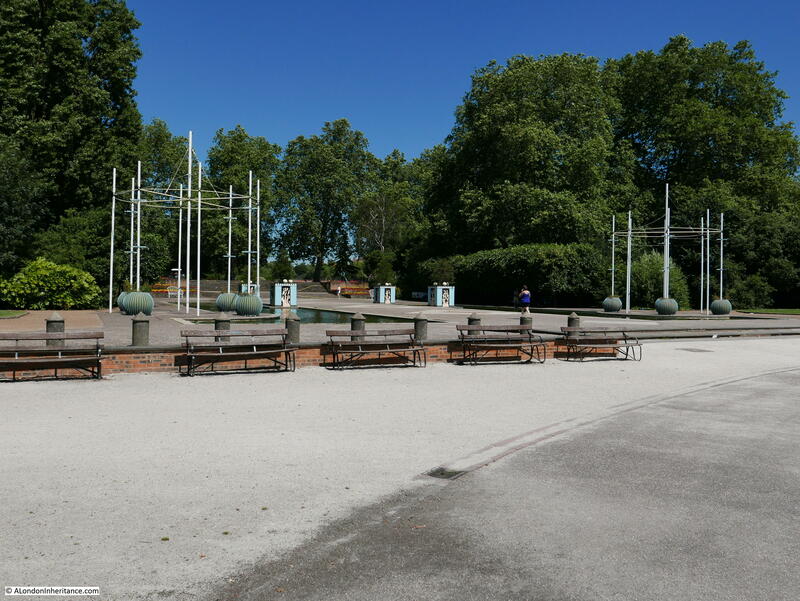 This entry was posted in Events and Ceremonies and tagged Battersea Park, Festival of Britain, Pleasure Gardens on July 24, 2016 by admin.